That quote illustrates the connections César Chávez saw among labor rights, social justice, and the environment as it was wrapped up in his work organizing farmworkers. With César Chávez’s birthday here for 2015, we are reminded of the man and his leadership—and there is the case for how that leadership was and is important in thinking about the disparate environmental impacts on stressed communities. We remember the marches, the huelga, and all other imagery associated the farmworker movement of the 60’s and 70’s. The struggle, la causa, has represented so much to many Latino communities, but most importantly it has represented the ability of communities to lead, to be empowered to make changes for the better. How have we—and how do we—connect la causa with climate change? Why does it matter so? When thinking about the environmental impact on farmworkers, an easy culprit was –and still is—pesticide use. People are being directly impacted by careless and at times illegal pesticide application. But scale farther out and we see a broader environmental impact on excluded communities. Forgive the crude comparison, but we are being “sprayed” by climate change. César Chávez understood the challenges he faced in organizing farmworkers and going against the growers. But he also understood the opportunity in confronting them as an obligation to improve the conditions of those most at risk, those seen as most disempowered. He saw and took the opportunity to lead for change for those whose voices were often least heard. To think that farmworkers could come together, organize, and challenge the established power structure set by the growers and their allies. But Cesar recognized a need for change, despite having to fight for it, and get it done. On his birthday and day of celebration, how do we continue to work for an improvement in the lives of farmworkers and other communities, and recognize the additional challenges in front of us, especially that of climate change? Climate change affects us all and in many ways. 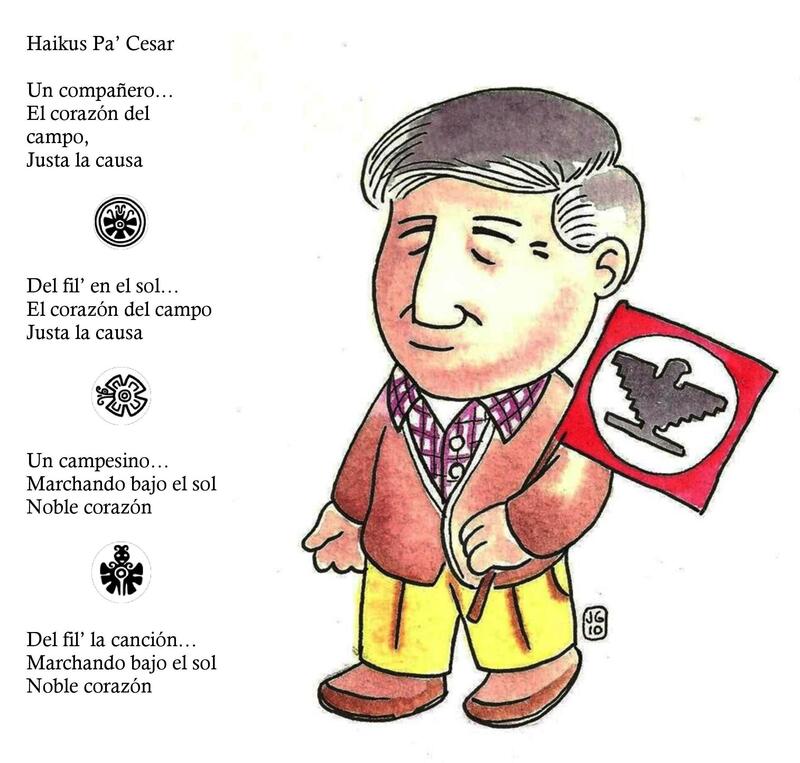 As a point of illustration, and with a bit of irony, the César Chávez National Monument, a permanent designation honoring the legacy of César and the farmworker movement was listed as threatened by climate change by the Union of Concerned Scientists. The report also clearly notes how the drought in California overall, a consequence of climate change, is directly impacting farmworker communities. How do we go about leading on this? Making the changes? There are a range of options, all of which require action and have been demonstrating Latino leadership. There is the work Voces Verdes is doing elevating Latino voices on the issue and pressing the need to deal with carbon pollution and implement the EPA’s Clean Power Plan. There is also community-based work like what the Little Village Environmental Justice Organization is doing in Chicago, The Center for Race Poverty & Environment in California’s Central Valley, The City Project in Los Angeles, and Texas Environmental Justice Advocacy Services in Texas. There are many more nationwide. Mexico and the US also just announced a partnership to work together on this issue. And not to forget, this is in addition to what polls and news stories have been better about presenting, that Latino communities clearly care and want action on climate change. We are beginning to organize and understand the need for change—while acknowledging it requires time and transition. When César Chávez fought and led for better working conditions he simply wanted better because he knew it was possible, that it was the right thing to do, and that although it would take time, it could be done. He knew that is was not the end to farm work, but that the way it was being done did not have to be the way it had to be done. Similarly with climate change, we do not need to accept the way things have been done. Yes, we still have a need for energy sources and live in a consumer society. But how we support that infrastructure and deal with our needs can change. César Chávez is an easy reminder of leadership, of what happens when the moment, the leaders, and the community come together for the betterment of our communities. The hard work is doing it, staying committed. The call today, the climate grito, is for all of us to do this, to work together in community, and to push our elected leaders to represent the community on this issue. Si se puede, pero hay que hacerlo. ← The outdoor arena through our collective eye.